When another character dies, Cao Pi can choose to take all of their cards. When Cao Pi is damaged, he can choose any character (other than himself) and force them to flip their character card. The flipped character then draws X cards, X being the difference between Cao Pi's maximum health level and his current health level after the damage was inflicted. 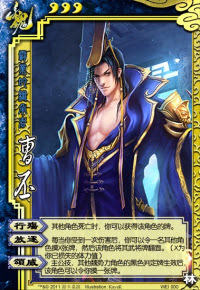 King Ability: When a Wei character flips a black judgement card, they can allow Cao Pi to draw a card. When Cao Pi activates "Unnatural Death," he takes all cards that belong to the dead character, including hand and equipped cards, but not pending judgement cards. "Exile" is activated on a 'per-instance' basis, not a 'per-damage' basis. For example, if Cao Pi receives two units of damage from an Attack with Wine, he can only target one character with this ability. When Cao Pi targets a character who is currently taking their turn with "Exile" is activated on a character taking their turn, they instantly draw the cards and flip their character card. The targeted character is not forced to skip the rest of their turn. However, the next turn that the take is skipped as they flip back to the upright position. If Cao Pi targets a flipped character with "Exile," their character card is flipped over to the upright position, allowing them to take their next turn. Note that "Exaltation" is not enforced; when a Wei character flips a black-suited judgement card, king Cao Pi can only draw a card if the Wei character allows him to. Cao Pi's "Exile" is devastating for an opponent when Cao Pi only has one unit of damage. Drawing one card does not offset a missed turn. Likewise, if Cao Pi is king and he is missing three units of health, an ally greatly benefits from Cao Pi flipping them and allowing them to draw three cards. "Exile" can be used on allies when Cao Pi is low on health in the hopes of allowing them to draw a Peach. Also, if Cao Pi is damaged twice before an ally's turn, he can flip them, then flip them back, giving them a large number of cards without forcing them to skip their turn. "Exile" and "Unnatural Death" can be used in unison if a weak character draws cards that cannot be used to save them from death. 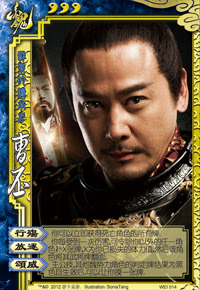 For example, if Cao Pi is hurt with two units of damage flips a character, they draw two cards. If Cao Pi or another character is able to kill the flipped character, Cao Pi gets all of the cards, including the ones that they drew for "Exile." "Unnatural Death" allows Cao Pi to draw a large number of cards each time he kills a rebel, as he gets all of the rebel's cards then draws three cards from the deck for the rebel bounty. "Exile" seems to offer little when Cao Pi has two units of damage. Since a character draws two cards during their turn, there is no net loss of cards Cao Pi flips them. Likewise, if Cao Pi chooses to flip an ally, there is no net gain unless they are able to save him so he can flip them again. The repeated use of "Exile" on a single enemy character can cause problems for Cao Pi and his team. Since players who are flipped do not have to worry about discarding cards at the end of their missed turns, they will simply accumulate cards for each turn that Cao Pi flips them. This will make it more difficult to kill these characters if they draw a lot of defensive cards. "Unnatural Death" is not always useful. It is common for a character to die with few to no cards. Also, Cao Pi is unlikely to get any Escapes from this ability. "Exaltation" is an extremely situational king power. Certain characters (Zhen Ji, Xiahou Dun, Deng Ai, Wang Yi) can benefit Cao Pi with this power, but most other Wei characters cannot do this on a regular basis. Cao Ren - Cao Ren and Cao Pi are a match made in heaven (or possibly hell, if you are facing this pair), as Cao Ren can activate "Entrench" to draw extra cards and flip his character card. The enemies then cannot do anything that would hurt Cao Pi, as Cao Pi could easily flip Cao Ren back face-up. However, Cao Ren has considerable leverage against Cao Pi if he is on the opposite team, since Cao Pi should not flip Cao Ren during his turn because doing so would allow him to use "Entrench" at the end of his turn to flip back with an additional three cards. Cao Zhi - Cao Zhi is similar to Cao Pi in that they both can benefit from Cao Pi's "Exile." Cao Zhi's "Wine Poems" allows him to flip his character card to use Wine when his card is face up. Cao Pi can let him easily flip back. The second half of the "Wine Poems" power gives Cao Zhi leverage against Cao Pi, as he can flip back when he is damaged if his card if flipped face down, mitigating the effects of "Exile." Zhen Ji (with Cao Pi as king) - Zhen Ji makes a great loyalist to her husband/king Cao Pi as her "River Goddess" allows her to flip over a lot of black judgement cards for Cao Pi's "Exaltation." Xiahou Dun (with Cao Pi as king) - Xiahou Dun is normally not a good loyalist, but in Cao Pi's case, he is serviceable due to the judgement card he flips for "Unyielding." 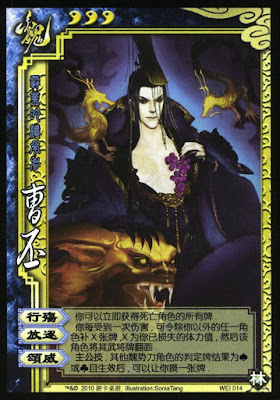 If this card is black, he can allow Cao Pi draw a card for "Exaltation." Deng Ai (with Cao Pi as king) - When Deng Ai activates "Military Farm" and flips a black-suited judgement when Cao Pi is king, he can allow him to draw a card via "Exalt." Wang Yi (with Cao Pi as king) - Between "Chasity" and "Secret Plan," Wang Yi not only has a good chance of being able to draw cards, but she also has a good chance of allowing Cao Pi draw additional cards via "Exalt." Wang Yi is a powerful loyalist to Cao Pi. Hua Tuo - Hua Tuo's "First Aid" is very helpful for Cao Pi. If Hua Tuo saves Cao Pi, Cao Pi can choose to "Exile" him and allow him to draw more cards. There is a good chance that Hua Tuo will draw more red cards that he can use as a Peach to save Cao Pi again. Huang Gai - Huang Gai's "Battered Body" allows him to convert his health into hand cards. Huang Gai can deal a large amount of damage to enemies, kill himself with his power, then Cao Pi gets to keep all of his cards with "Unnatural Death." God Cao Cao/God Lu Bu - These characters work well with Cao Pi. Both of these characters have abilities that force them to flip their character card (God Cao Cao's "Tribute" and God Lu Bu's "Divine Anger). Cao Pi can easily re-flip them to mitigate the negative effects of these abilities. Zhang Fei - Zhang Fei can sometimes put Cao Pi in a difficult situation. If Zhang Fei damages Cao Pi, he may have reservations about flipping Zhang Fei as this may result in him drawing more Attacks. This allows Zhang Fei to Attack Cao Pi without as much fear as other characters. Zhang Chun Hua - Zhang Chun Hua's "Unfeeling" prevents Cao Pi from activating "Exile" when she damages him. This does not mean that Cao Pi cannot flip her when other characters damage him, but this power still causes problems for him during her turn. King Cao Pi is a good king choice. His king power is situational, but if he has the right loyalist(s), he will be able to benefit greatly from "Exaltation." With the additional unit of health, he can use "Exile" on a loyalist to let them draw three cards when his number of health units is reduced to one. However, it should be noted that rebels will try to kill loyalists and spies before killing Cao Pi. To counter this strategy, willingly take damage when any character plays Barbarians and Hail of Arrows. Loyalist Cao Pi can be a good, but potentially flawed, loyalist. "Exile" allows him to banish the rebels. However, some rebels may not want to hurt Cao Pi because of this power and may focus even more on trying to kill the king. As with before, this tactic can be countered by willingly taking damage. As mentioned previously, he also has the potential to draw a lot of cards when killing rebels. Rebel Cao Pi is a great rebel. If the king is foolish enough to play Barbarians or Hail of Arrows on their first turn, Cao Pi can give them a nasty surprise in the form of "Exile." While the king is out of the game, they can expect to take heavy damage from Cao Pi and the other rebels. Spy Cao Pi is a good spy pick. He can keep the game balanced by flipping players on both sides as they become stronger or weaker. Also, he gets to keep all of the cards of the fallen characters. Cao Pi is a great character who can handle all roles well. However, he has a bit of a learning curve and is not a good beginner pick. If his powers are used incorrectly, he can cost himself and his team the game. Remember that a turn, like a unit of health, is approximately worth two cards. "Exile" enemies when you are missing one unit of health (so they only draw one card), "Exile" allies when you are missing three units of health as king, and use discretion when choosing who to flip if you are missing two units of health. Also keep track of whose turn it is when you are choosing who to flip. It is sometimes worth it to flip an enemy who is about to take a turn if it means that an ally who is low on health will get a temporary reprieve from their assault. It is also important to keep in mind that "Exile" usually is not a permanent solution to your problems. Using this power on the same character time after time will result in this character accumulating a lot of cards, which can cause long term problems.